Customer service IS the new marketing. Answer EVERY customer, in EVERY channel, EVERY time. Fully one-third of all customer complaints are never answered – mostly online. Not answering customer complaints robs you of opportunities to turn that customer around, demonstrate your values to the online audience of onloookers, and use negative feedback as a petri dish for improvement. 80% of companies say they deliver superior customer service. 8% of their customers agree. This is a huge problem, and businesses that embrace the Hug Your Haters recipe will become leaders in their industry. Specifically, my work as a social media and content marketing strategist provided me many opportunities to see companies large and small struggling with the speed and volume of customer interactions. If you’re still thinking of customer service as a “call center” and a “necessary evil” you need to immediately get your head around the digital shift and customer service as revenue driver. Haters are not your problem, ignoring them is. I partnered with Edison Research and conducted a massive study on the science of complaints. We found that answering a customer complaint increases customer advocacy always, and in every channel. It makes a bad situation better. Conversely, not answering a customer complaint decreases customer advocacy always, and in every channel. It makes a bad situation worse. Yet, one-third of complaints are still ignored. 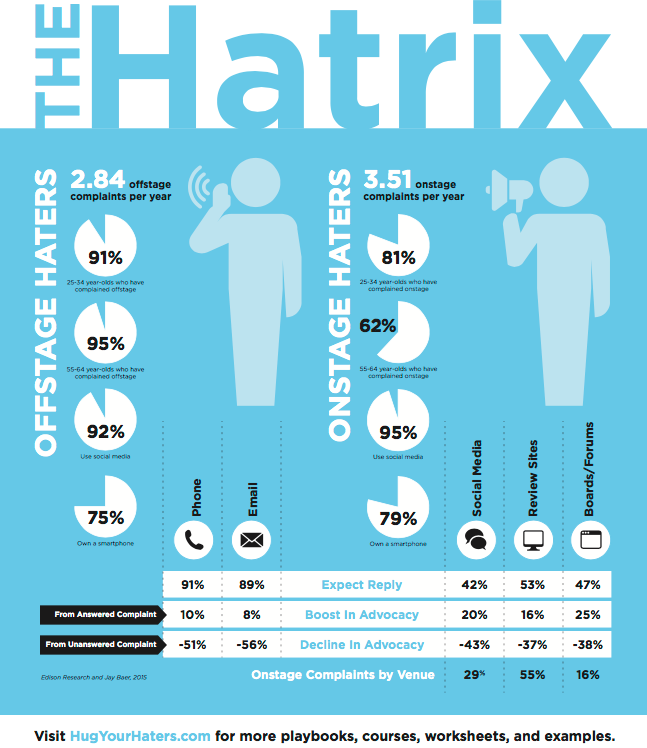 The signature data of the book is The Hatrix, the analysis of the two main types of haters, their expectations, and the advocacy impact of answering (or not answering) their complaints. Recognize that customer service is the new marketing, commit the necessary resources to be great at customer service (especially online), and answer every customer complaint, in every channel, every time. 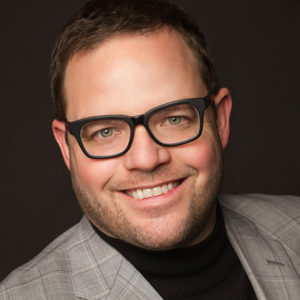 I’m the President of Convince & Convert, a New York Times best-selling author of five books, a keynote speaker, startup investor, and tequila fan. With my team of genius consultants, I help the world’s most interesting companies gain and keep more customers. I love the book Different by Youngme Moon. Spectacular work on differentiation within competitive categories. My friend Rory Vaden wrote a book last year called Procrastinate on Purpose that fully changed how I think about priorities and time management. Highly recommended! Pretty much anything by Bill Bryson has influenced me, as my writing style is a very poor imitation of his. Most of my challenges have been self-imposed. I tend to leap before I look, whether it’s quitting jobs, starting companies, inventing podcasts, writing books, etc. The biggest challenge I have consistently is following through on ideas and projects that I start. I like the ideation more than the execution, and so I’m incredibly fortunate I have an amazing team to help me! I am a certified BBQ judge, so I can go on long, rambling dissertations about the merits of various types of pork ribs, and other meat-based esoterica. I remain very proud of my previous book, Youtility. It continues to sell well, which is nice, but more importantly it has helped usher in the concept of useful marketing to marketing teams all over the world. The hard part about writing a book about customer service is that everyone already thinks they are good at it. I guarantee that if you read Hug Your Haters, you’ll discover you have a long way to go. I’m also delighted that the book is rooted in real research, not just anecdote. And that research is buttressed by more than 70 interviews I did for the book. 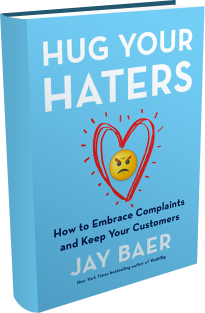 It doesn’t matter if you’re a sole proprietor, a small business, or a giant corporation; if you have customers, you’ll learn from Hug Your Haters.